Since version 0.8.0 the measurements received by the client are in SI units. All locations have been converted to meters and speeds to meters/second. Every frame the server sends a package with the measurements and images gathered to the client. This document describes the details of these measurements. frame_number uint64 Frame counter (it is not restarted on each episode). platform_timestamp uint32 milliseconds Time-stamp of the current frame, as given by the OS. game_timestamp uint32 milliseconds In-game time-stamp, elapsed since the beginning of the current episode. In real-time mode, the elapsed time between two time steps should be similar both platform and game time-stamps. When run in fixed-time step, the game time-stamp increments in constant time steps (delta=1/FPS) while the platform time-stamp keeps the actual time elapsed. transform Transform World transform of the player (contains a locations and a rotation) respect the vehicle's mesh pivot. bounding_box BoundingBox Bounding box of the player. acceleration Vector3D m/s^2 Current acceleration of the player. forward_speed float m/s Forward speed of the player. collision_vehicles float kg*m/s Collision intensity with other vehicles. collision_pedestrians float kg*m/s Collision intensity with pedestrians. collision_other float kg*m/s General collision intensity (everything else but pedestrians and vehicles). intersection_otherlane float Percentage of the vehicle invading other lanes. intersection_offroad float Percentage of the vehicle off-road. autopilot_control Control Vehicle's autopilot control that would apply this frame. The transform contains the location and rotation of the player. location Vector3D m World location. orientation [deprecated] Vector3D Orientation in Cartesian coordinates. rotation Rotation3D degrees Pitch, roll, and yaw. Contains the transform and extent of a bounding box. transform Transform Transform of the bounding box relative to the vehicle. extent Vector3D m Radii dimensions of the bounding box (half-box). Collision variables keep an accumulation of all the collisions occurred during this episode. Every collision contributes proportionally to the intensity of the collision (norm of the normal impulse between the two colliding objects). Three different counts are kept (pedestrians, vehicles, and other). Colliding objects are classified based on their tag (same as for semantic segmentation). Collisions are not annotated if the vehicle is not moving (<1km/h) to avoid annotating undesired collision due to mistakes in the AI of non-player agents. The lane intersection measures the percentage of the vehicle invading the opposite lane. The off-road intersection measures the percentage of the vehicle outside the road. These values are computed intersecting the bounding box of the vehicle (as a 2D rectangle) against the map image of the city. These images are generated in the editor and serialized for runtime use. You can find them too in the release package under the folder "RoadMaps". The autopilot_control measurement contains the control values that the in-game autopilot system would apply as if it were controlling the vehicle. This is the same structure used to send the vehicle control to the server. To activate the autopilot from the client, send this autopilot_control back to the server. Note that you can modify it before sending it back. # modify here control if wanted. (*) The actual steering angle depends on the vehicle used. The default Mustang has a maximum steering angle of 70 degrees (this can be checked in the vehicle's front wheel blueprint). Since version 0.8.0 the player vehicle is not sent in the list of non-player agents. To receive info of every non-player agent in the scene every frame you need to activate this option in the settings file sent by the client at the beginning of the episode. (*) At this point every pedestrian is assumed to have the same bounding-box size. The transform defines the location and orientation of the agent. 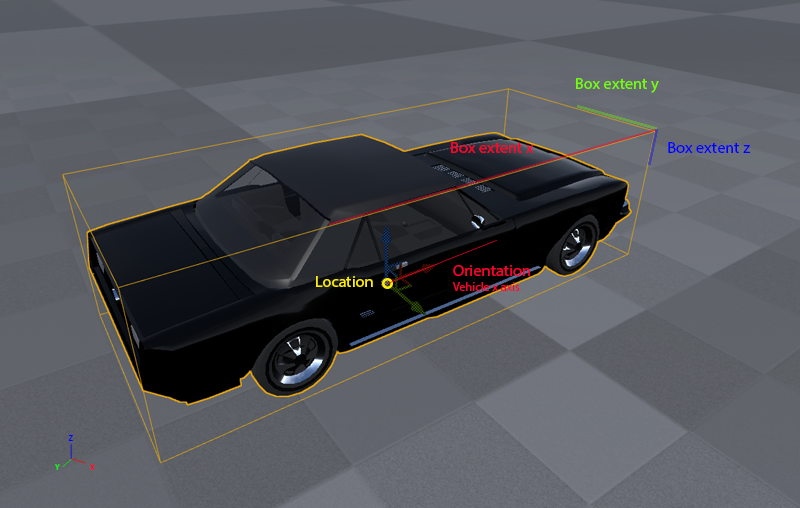 The transform of the bounding box is given relative to the vehicle. The box extent gives the radii dimensions of the bounding box of the agent.